Does the ZDX have what you want out of a vehicle? Scroll past the video to find out! All Acura dealers in Fort Worth aren't the same. At Vandergriff Acura, we feel it's our responsibility to supply customers with quality Acura reviews that set us apart from the typical dealer. 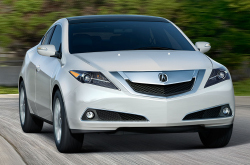 All of the things you need to know about the Acura ZDX are right here in this article. Each passage is full to the hilt with practical info and ZDX details. Get started by watching the video below or move on to the full review. When considering the 2013 Acura ZDX alongside the 2013 Cadillac SRX, Range Rover Evoque, Audi Q7, Lincoln MKT and the BMW X6, and you can notice that the ZDX out does those autos in loads parts. Check out the hightlights below. Acura ZDX owners won't get the same phenomenal factory-trained Acura mechanics and trustworthy Acura parts at a independent service company. But at our Fort Worth dealership you'll have access to this every time you visit, along with the comfort that comes with acquiring a 12-month long service warranty. Don't overlook servicing your Acura. Turn to Vandergriff Acura's distinguished mechanics. For simple oil changes and other Acura services like tire rotation and replacement and battery replacement, come to us. We even work on more elaborate operations with without breaking a sweat, including jobs like shock and strut repair. Vandergriff Acura's got your back for all Acura ZDX maintenances in Fort Worth, including easy to complete factory recommended services. You can find coupons any time at the upcoming link.